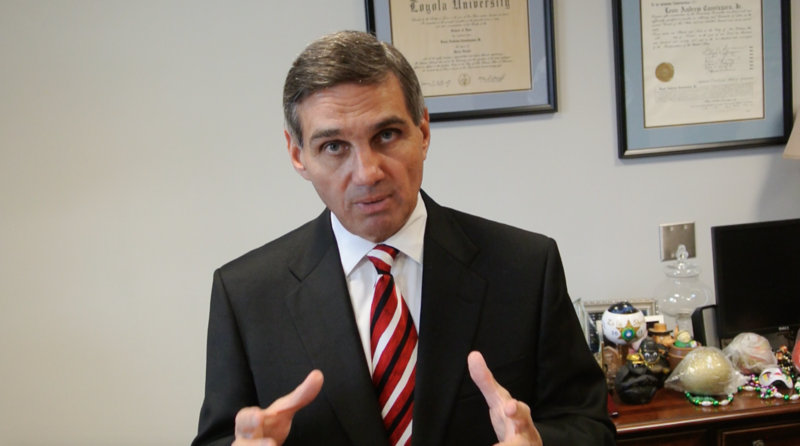 In 2014, as he entered into a campaign for re-election, Orleans Parish District Attorney Leon Cannizzaro gave a speech at Dr. Martin Luther King, Jr. Charter School on the state of the criminal justice system in New Orleans. The speech was a balancing act. Cannizzaro issued some tough-on-crime rhetoric. But he also touted progressive reforms, such as an increase in victim counselors, an expanded pre-trial diversion program under his watch, cracking down on prosecutorial misconduct, building community trust, and a new Conviction Integrity and Accuracy Project in partnership with the Innocence Project New Orleans, that would scrutinize potential past cases of wrongful conviction. He also had praise for City Councilman Jason Williams — a defense attorney — who gave the introduction to his speech. Much has changed since 2014. The Conviction Integrity and Accuracy Project no longer exists. Public perception of the office’s integrity and its sensitivity to victims has not fared much better. Revelations that the DA’s office was issuing fake subpoenas to compel witnesses to testify, and at times jailed victims of domestic abuse and sexual assault, drew national media attention and harsh condemnation from local officials. In October of 2017, the ACLU and the Civil Rights Corps filed a federal civil rights suit against Cannizzaro and several of his prosecutors. According to quality of life studies conducted by the University of New Orleans Survey Research Center, Cannizzaro’s approval rating dropped from 55 percent in 2016 to 42 percent in 2018. City Councilman Jason Williams, for his part, has emerged as a vocal critic of Cannizzaro and announced that he’ll be running for District Attorney in 2020. Williams also ran for the position back in 2008, when Cannizzaro was first elected. He placed third in that race, failing to make the runoff. A spokesperson for Williams did not respond to a request for comment on this story. The conciliatory tone Cannizzaro used to approach reform advocates in 2014 also seems to have now disappeared. Recently, he has been outspoken about what he views as city officials imperiling public safety through reform efforts that have gone too far. It is a political stance that some who spoke with The Lens say is a reasonable response to the city’s crime rate. Others, however, said it could place him at odds with criminal justice trends both locally and nationwide if he decides to run for reelection in 2020. According to The Advocate, earlier this month, in a speech at the Metropolitan Crime Commission luncheon, he characterized current efforts to decrease the jail population as “grand social experiment espoused by sheltered academics and naïve politicians” and urged the “silent majority of New Orleans residents” concerned about public safety to speak up. In a statement, Cannizzaro’s spokesman Ken Daley said it would be “premature” to comment on an election that is nearly two years away. But he defended Cannizzaro’s record, saying the DA supported criminal justice reform programs when he believed they would work. This charged atmosphere between the city council, reform groups, and the DA’s office previews what will likely be a contentious district attorney’s race in 2020, no matter who the candidates are. Edward Chervenak, a political analyst and the director of the UNO Survey Research Center, has also sensed a shift away from the traditional rhetoric surrounding DA races in the past. The last few years have been productive for criminal justice reform advocates and those hoping to reverse the trend of mass incarceration in New Orleans. In 2016, the Louisiana State Legislature passed the Justice Reinvestment Act, a series of bills that reduced the state’s prison population enough for Louisiana to relinquish its title as the incarceration capital of the United States. Last October, Governor John Bel Edwards announced that $3.4 million of the money saved from the effort would be reinvested in organizations in Orleans, Jefferson, and St. Tammany Parishes, that aim to help those who have been released from prison transition back to society. Then, in November, another victory was delivered to reformers when Louisiana voters overturned a Jim Crow-era law that had made Louisiana one of only two states that allowed non-unanimous jury verdicts on felony trials. Across the country, criminal justice reformers have begun focusing on the position of the district attorney as an essential element to reversing the trend of mass incarceration. Larry Krasner in Philadelphia, Kim Foxx in Chicago, and Wesley Bell in St. Louis, among others, have won elections on platforms arguing for a less punitive and more equitable justice system. A national 2017 poll by the ACLU found that 89 percent of voters think that it is important for their prosecutors to prioritize decarceration by utilizing prison alternatives. Miriam Krinsky is the director of Fair and Just Prosecution, an organization that works with elected prosecutors across the country to implement reform policies. She told The Lens that nationally, there is a new public awareness of the importance of the district attorney’s position, as well as an appetite for reducing incarceration. “Voters have now been gaining a deeper understanding of the incredibly impactful role of prosecutors. We’ve been seeing more incumbents being challenged, which used to be unheard of, and we’re seeing individuals successfully challenging incumbents by promoting an agenda of turning back the tough-on-crime tide,” she said. Bunton views the claims by Cannizzaro that there is a “silent majority” of New Orleans residents who are concerned about their safety as misguided, and that reform efforts to reduce the jail population have not resulted in more crime. Daley, Cannizzaro’s spokesman, said in an email that labeling Cannizzaro as opposed to reform was a mischaracterization. As examples of the DA’s efforts to reform the office, Daley pointed to his 2009 support for treating simple marijuana possession as a municipal offense — allowing police officers to issue summonses rather than arresting suspects — and the implementation of an expedited case screening process to try to reduce the amount of time criminal suspects spend in jail before trial. That funding was restored in this year’s budget, but at a budget hearing late last year, Cannizzaro said he intended to use most of it to pay for prosecutors, not the diversion program. But he added that judges can’t ignore defendants’ criminal histories, their risk of flight and the danger they might pose if released from jail. Those who are critical of the DA and his rhetoric also acknowledge the fact that high rates of violent crime in the city are likely to shape the debate over reform. Mike Glasser, president of the Police Association of New Orleans, echoed the DA’s concerns about efforts to reduce the jail population. “There is a sociological push to reduce incarceration, and I think in an effort to reduce incarceration we have taken some steps that will ultimately prove counterproductive,” he said. Metropolitan Crime Commission President Rafael Goyeneche and New Orleans Police and Justice Foundation CEO Melanie Talia, both former Orleans Parish prosecutors who have supported Cannizzaro in the past, did not respond to requests for an interview. And Pete Adams, the executive director of the Louisiana District Attorney’s Association, declined to comment. Simone Levine, the director of Court Watch NOLA, a non-partisan watchdog group that observes courtrooms and issues recommendations, emphasized the need for the DA’s office to be more collaborative and public-facing in their approach to prosecuting crimes. She also suggested that the next DA place satellite offices in poorer neighborhoods to increase their visibility and strengthen community trust, as well as increasing the number of social workers and victim advocates. Levine has been a vocal critic of the DA’s practice of jailing victims of domestic abuse and sexual assault, which she sees as a product of the office’s willingness to prioritize getting a conviction over the trauma of the victim. Among the other issues reform advocates are hoping to see addressed in the upcoming election are bail reform, use of the habitual offender statute — which Cannizzaro’s prosecutors once used far more than anywhere else in the state, but scaled back in 2017 and 2018 — policies surrounding pre-trial discovery, the practice of charging juvenile offenders as adults, and the possibility of re-establishing a conviction review unit operating within the district attorney’s office.